Biocyte Collagen Express Gummies Anti-Aging Skin Beauty Gummies 30 Gummies is a gummy based of Collagen and Vitamin C.
These gummies are rich in Collagen and Vitamin C, they provide to your skin a real youth boots in daily. 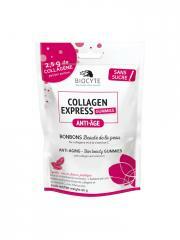 Delivering dose of 2,5g of Collagen per day, Collagen Express Gummies have an anti-aging action while being enjoyable to eat. These gummies are advised to the persons from 35 years having wrinkles and/or a loss of density on the skin, also recommended for those wishing to delay the signs of aging. Gummies with Blackcurrant, Strawberry and Watermelon flavors. Take 1 to 3 gummies per day, during 10 to 30 days. Indication: Beauty of the skin, anti-aging. Édulcorants : Maltitols, Glycosides de Stéviol, Hydrolysat de Collagène 28,3%, Gélatine, Ascorbate de Sodium (Vitamine C : 0,88%), Acidifiant : Acide Citrique, Arômes, Colorant : Anthocyanes, Concentrés Colorants de Sureau, Spiruline et Carthame, Huile de Coprah et Colza, Agent d'Enrobage : Cire de Carnauba, Amidon de Blé.